Jack Peters' A Quack For Jack sloshes over a sloppy racecourse Thursday afternoon to post the fastest schooling race time at Remington Park in Oklahoma City. OKLAHOMA CITY, OK�MARCH 6, 2014�Trainer Kasey Willis saddled Jack Peters' A Quack For Jack to the fastest time from 84 two-year-olds who participated in 15 schooling races at Remington Park Thursday. The Oklahoma City track will open their 2014 Quarter Horse and Mixed Breed Meet tomorrow (March 7). The races were run over a sloppy racecourse with a headwind kicking up about half way through the afternoon. A Quack For Jack won the 8th race easily into a 7 mph headwind covering the 250 yards in :13.51 seconds. Jack and Joyce McClennen bred the IVORY JAMES filly in Oklahoma from the Tour de Kas mare Tour de Quack. Kasey Willis saddled another IVORY JAMES two-year-old to victory in the 1st race. American Ivory broke well on the outside and moved with a steady run to finish a head in front of Bv Never Give Up. The bay gelding out of American Dove, by Toast To Dash, is owned by Alexia Memile and was bred in Oklahoma by A.C. Taylor. He set the fourth fastest time of :13.66. For a complete list of horses by times who competed in today's schooling races CLICK HERE. Videos of today's races can been found on the OQHRA website. 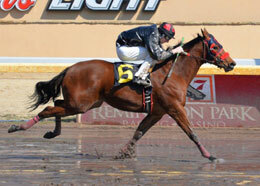 The 2014 American Quarter Horse & Mixed-breed Season at Remington Park begins tomorrow (Friday) and continues thru June 1.